It was a little tough trying to get this immature to pose so I could get a good shot of his disease. I'm sure it's not as tough as what he has to deal with. Avian Pox. It can be deadly to the bird, however it can be treated also. I can go into detail here, but the University of Northern British Columbia has done a great job of it so I'll just give you a link to it. 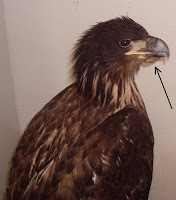 This bird went into surgery last night to have the lesions removed. I'll have an update for you later on it's condition and maybe some pictures of the procedure. 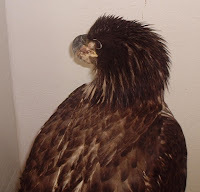 It is highly contagious to other eagles, so quarantine procedures are being taken.